I can't believe I didn't bring my camera for this one! Beautifully preserved - Sitting in the magnificent timber stalls upstairs I easily imagined the days Boy Charlton and Frank Beaurepaire raced in this 100 ft (30m) x 4 lane masterpiece. The water was pretty warm - nice for a leisurely 2k. It was like swimming in an antique. Gazing up through the glass panes that run through the centre of the almost original ceiling the juxtaposition of skyscraper and the 19th century architecture of these majestic old baths is a breathtaking contrast. Next to the main pool is the 'ladies pool' (only 50 feet in length) but as wonderfully preserved as the main pool. The changing booths that surround it preserve the modesty of their times. This is a swimming icon. This has to be one of the most spectacular pools I've swum in. It was pretty cold and I only made 600m before seeing icicles forming in my eyeball fluid. Soft I know, but I'm the first to admit to being a fair weather swimmer. Although the tide was out and the waves weren't coming over the edge, I could feel some sort of current but couldn't work out where it was coming from. The first couple of laps were painful but became quite pleasurable for a while - that fine line between pleasure and pain - before my arms began to go slightly numb and my brain froze. Straight out of the pool and into the most gorgeous warm shower where at first I thought I'd been stung all over by sea lice but soon realised this was just some sort of physiological re-adjustment. Next into the most awe inspiring sauna in the world with breathtaking views across the bay towards North Bondi. I just sat and watched the bondi surfers - for how long, I'm not sure. Afterwards the Crab Hole served me a delicious smoked salmon, goats cheese and rocket toasted sandwich and a nice strong latte while I sat in the sunshine and contemplated life. 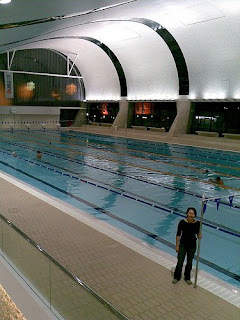 A beautiful new indoor aquatic complex in Ultimo, near Darling Harbour. Walking from Central Station it wasn't that easy to find and probably took almost an hour (not in a straight line). A map may have helped, the GPS didn't. Sparkling clean modern facilities with lots of white it includes an 8 lane 50m pool, teaching pool, leisure/kids pool, spas, sauna and steam room. Entry $6. I think there was a gym too. Change rooms were small but clean. Too bad I didn't know they had a hairdryer (that's important!) - or I wouldn't have lugged mine across Sydney. Great architecture - a wave-like ceiling. I heard the comment that you could probably ski down the roof...? I'd hoped to join in with a Masters squad but there are none training there as yet so I swam a leisurely 2km in clear water, the temperature was perfect. What a great pool, I wish we had something similar in the city of Adelaide. I love swimming but also enjoy the journeys it has taken me on. So this is the beginning of documenting and recording some of them.